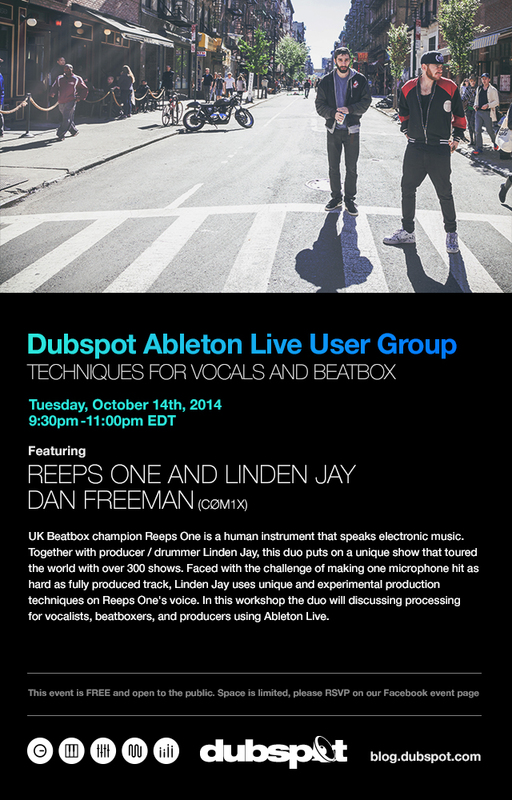 Our Dubspot Ableton User Group continues on Tuesday, October 14th with UK beatboxing champion Reeps One and producer / drummer Linden Jay. They will discuss processing for vocalists, beatboxers, and producers using Ableton Live. UK Beatbox champion Reeps One is a human instrument that speaks electronic music. Together with producer / drummer Linden Jay, this duo puts on a unique show that toured the world with over 300 performances. Faced with the challenge of making one microphone hit as hard as fully produced track, Linden Jay uses unique and experimental production techniques on Reeps One’s voice. In this workshop the duo will discussing processing for vocalists, beatboxers, and producers using Ableton Live.